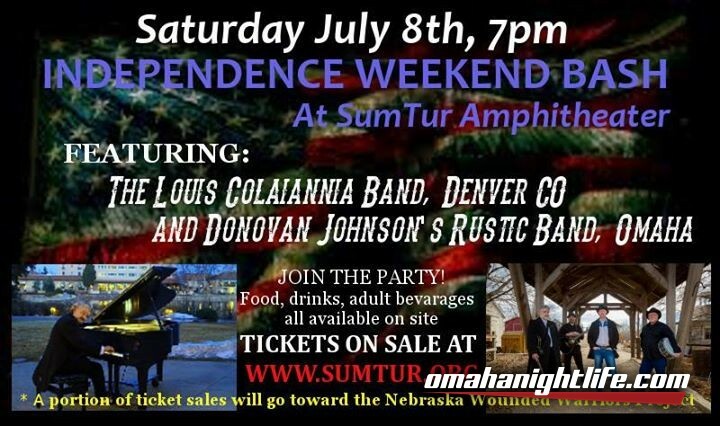 The Donovan Johnson Band (Omaha NE) and the Louis Colaiania Band (Denver CO) will be performing live at the SumTur Amphitheater this Independence Day weekend, join the lawn party! Food and beverages for both adults and children will be available at the concession booth - sandwiches, hot dogs, popcorn, pop, beer, chips, and more! Saturday night, July 8th at 7pm, sit outside and listen or get on your feet and dance into the night with the music of these nationally recognized, multi award winning artists! Both performers promise a great time, and will be performing for a great cause as well: A portion of the proceeds from this concert will go toward the Nebraska Wounded Warriors Project. Come join the lawn party! Donovan Johnson has traveled all over the US, holding music workshops and performing for audiences of all sizes. His music is described as "Cowboy Zen," combining Honky Tonk, Rock, Americana and New Age musical styles to create a sound that is unmistakably his own. His performances include concerts at Carnegie Hall, the Place Des Arts in Montreal, Canada, London UK, aboard Carnival Cruise Lines, and a 2017 performance scheduled at the Grand Ole Opry. The band will be performing some of Donovan's original songs along with some well known country favorites to keep you on your feet! His music can be heard on Pandora radio, Spotify, ITunes, Amazon, and many other online and public radio stations, and his sixth album release "Rustic Piano - A Day At Heart Land Hill" will be available at the show. Louis Colaiannia is a national touring musician based in Denver CO. His aggressive "pop-jazz" approach to songwriting is energizing, engaging, and demands your attention. A masterful pianist and performer, Louis will only leave you wanting more at the end of the night. Colaiannia has also performed at Carnegie Hall, is a Primo Award winner for two years in a row for Italian American Entertainer of the Year, and was recently inducted into the Colorado Italian American Hall of Fame. His album "Closer" debuted number 5 on the Zone Music Reporter Charts, and his album "The Next Stage" was nominated as "Best Chill/Groove Album" for 2013. You don't want to miss this one time, one night only performance. Come celebrate Independence Day 2017 with us, and be sure to purchase your tickets early!